Eat yourself happy with this informative guide to eating right and improving your mind-set.We all feel low and discouraged from time to time, but when these feelings continue for weeks and even months, it's time to do something about it.There are dozens of different types of depression, with... read more different causes, but almost all are improved by eating the right kinds of foods to synthesise ample supplies of brain neurotransmitters, address vitamin and mineral deficiencies and stabilise blood sugar levels.It's important not to choose sugary foods that offer a quick burst of energy and alcoholic drinks that dull the pain - these will both make depression worse. 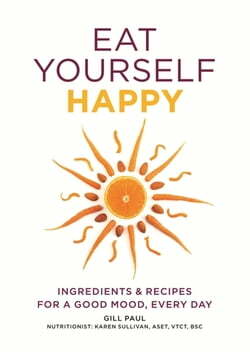 No matter how you feel, making wise food choices will help - and you'll feel the benefits start straight away.Featured in this book are the key foods that have been proven to increase the feeling of wellbeing in our minds and bodies. A clever problem-solver helps you choose the ingredients that address your symptoms, and the results are immediate.With over 60 easy-to-follow, quick-to-prepare, completely delicious recipes, and weekly meal planners, Eat Yourself Happy is the perfect way to boost your mood and achieve optimum health.Eat Yourself Happy includes...Part I Happy SuperfoodsSuperfoodsWhat's your problem?Putting it all togetherPart IIHappy RecipesBreakfastSnacksLunch DinnerDesserts...And much much more!